Being fully present as your child plays does not always mean you interact - unless invited, of course. Sometimes its nice to just sit back and watch the magic happen. My son was playing with his dragon fly a lot yesterday, so while he was sleeping, I set something up hoping to inspire him to play and create. Initially, I just watched as he created. I simply LOVE how his mind works. He made a dragonfly - "one, two, three, four - four wings....and one, two, three, four - four wings" - as he counted and compared and then beamed with pride at his creating. 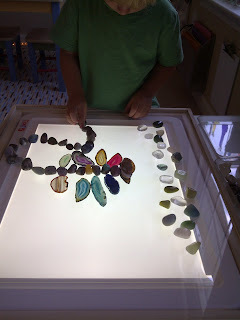 Quietly adding rocks and more agate slices. 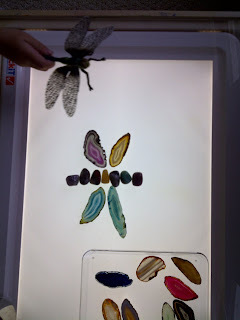 "There are lots and lots of dragonflies now....in the forest. Oh, its raining. There are rain clouds in the sky. The forest has lot of dooga digglies everywhere." [I have no idea what dooga digglies are - he likes to make up words sometimes. LOL]. This was the last step before he started to clean up. BEAUTIFUL!! Do you see all the dragonflies in the forest? I do! Just to add another dimension, we put a 3 way mirror behind our forest. oooh I forgot I had agate slices, I need to dig them out for our light box! are you familiar with tracing tables? 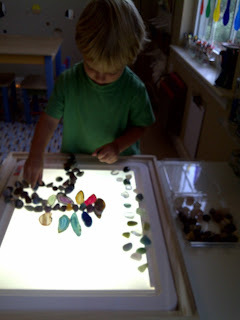 (such as an artist would use) - would that be similar in durability to one of the actual light boxes made for kids? Hi, where did you purchase the agate slices? I'd like to know about where to find agate slices too, please.